Andrew Flintoff was all shook up, David Lloyd was on-song and Notts walked off with the title. Finals Day 2017 will take some beating! All the best bits from last year's T20 Blast Finals Day, including Samit Patel's performance and Andrew Flintoff's tumble! It is going to be a tough one to beat - but make sure you join us for Vitality Blast Finals Day this Saturday from 10.30am! Samit Patel scored 64 not out from 42 balls as he shared a 132-run stand with Brendan Taylor to help the Outlaws post 190-4 in their 22-run win in the final at Edgbaston. The 32-year-old then ran out Birmingham's Ed Pollock with a direct hit to cap off a game he hoped the England selectors were keeping an eye on. "I'd be disappointed if they didn't watch that," said Patel. "Playing for England is the utmost best for me. I love playing for England. Every time I put on an England shirt I don't think that I've let them down." Patel played a key role for Nottinghamshire in their T20 Blast and Royal London One-day Cup triumphs that year, and after not featuring for England since being an unused squad player in South Africa two years ago, the all-rounder believed he warranted another chance. "Yeah it has hurt, especially in the white-ball format," said Patel of his international exclusion. "I'm an ambitious player. "You shouldn't play for Notts if you don't want to play for England in my opinion. Putting on that shirt, it means everything to me. David 'Johnny Cash' Lloyd and Andrew 'Elvis Presley' Flintoff sing off at Finals Day. "Don't even count me out of Test cricket to be honest. I think I know my game much better now. I'm ready, I know I'm ready if they ring me, that's for sure. I'm a different player." 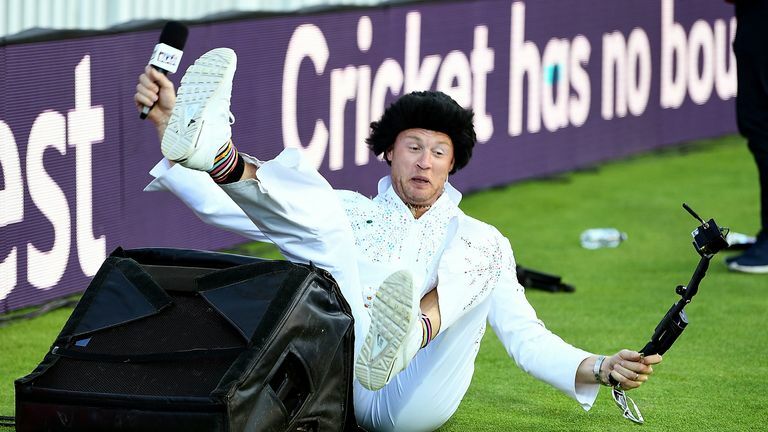 Andrew Flintoff may have come close to matching Elvis' voice with his rendition of Suspicious Minds, but he wasn't quite as comfortable in the blue suede shoes as the former England all-rounder took a tumble in front of a jubilant Edgbaston crowd. Despite the crowd's cheerful reaction, nobody was happier to see Flintoff take a tumble than fellow Sky Sports pundit Rob Key, who said: "That was absolutely brilliant - my favourite moment of the year!" While Patel starred for the Outlaws with the bat, it was Harry Gurney's bowling that kept Birmingham at bay in the second innings of Saturday's final. The opening bowler went for 17 runs in his four overs, which suffocated the Bears' batting in the early stages of their chase. An economy rate of 4.25 per over is a contribution in itself, but the 30-year-old more than played his part in the victory by removing Birmingham's three top-scorers late in the game to help seal the win, and finish with figures of 4-17. The Bears made the final courtesy of an 11-run victory over Glamorgan in the first semi-final earlier in the day at Edgbaston. The victory denied Glamorgan skipper Jacques Rudolph a chance to claim silverware in his final outing in T20 cricket. Rudolph's effort of 65 off 39 balls may have been in vain, but that was not the case for Bears captain Grant Elliott, who took a spectacular catch to remove the dangerous Colin Ingram for 11 and reduce Glamorgan to 31-2 after 3.2 overs of their run-chase. Was it one of the catches of the tournament? Notts captain Dan Christian got a T20 blast to the face! It has been said that you shouldn't do anything great if you can't handle the congratulations, and Dan Christian found that out the hard way when his trophy lift came at a price on Saturday evening. Just as Christian was receiving the silverware, champagne started raining down, and as a result the trophy was handed to him in such hurried fashion that he caught an eyeful of it.